Help Your Office Beat the Flu This Season With Our FREE Flu Course! 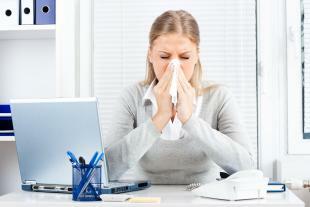 We’re officially into flu season; is your workplace prepared? It’s important employees know the plan for illness and what your company’s policies are on issues like working remotely and sick days. Caution is best; if you’re feeling ill, evaluate your symptoms and make the call whether the signs point to being too sick for the office. Preventing illness from spreading through your office keeps employees, partners, and customers happy and healthy. After all, sick workers are unproductive workers! Check out these quick facts from Flu.gov, managed by the US Department of Health and Human Services. The flu is a contagious respiratory illness caused by flu viruses The seasonal flu season starts in the fall and usually peaks in January or February (as early as October and as late as May). The flu vaccine can significantly decrease your risk of getting the flu (see if your organization does a vaccination day!). Illness often lasts one to two weeks. How can you protect your office? The flu spreads when someone with the virus coughs, sneezes, etc and the droplets containing the virus land in someone else’s nose or mouth. It is also spread through touching surfaces contaminated by the virus. Pretty gross, right? Encourage sick employees to stay home. If possible, put in place a plan for them to work remotely or contribute in some way (one to two weeks is a long time to be on sick leave!). Train your team on what to do when they (or someone in their family or social circle) get the flu. This free course from BlueVolt specifically covers how to deal at home, at work, and while traveling. Covering what the flu is and how it spreads, reducing exposure when you’re on the road, step organizations can take to reduce the spread of flu in the workplace, tips for keeping yourself healthy when working with colleagues and customers, and more, this course is a must-take! You and your team will surely benefit from this quick, 10-minute course. Visit opensesame.com/flu to get started! And as always, if you have questions, please visit support.opensesame.com or send us an email at info@opensesame.com.